It amazes me how modern life can blind us to the historical realities that are all around us. It's not just that we consciously ignore the echoes of the past, sometimes we're just deaf to it. A couple of months ago, my family moved to a small coastal hamlet south of Daytona Beach called Ponce Inlet. Any gearhead worthy of the name will immediately associate Daytona with America's most popular motorsport--NASCAR. Indeed, having grown up near here, and now living within spitting distance, I can tell you that the influence of NASCAR on Daytona cannot be understated. Daytona International Speedway looms large over a newly-paved, eight-lane thoroughfare named "International Speedway Boulevard" where one can find a few of the traditional mom-and-pop tourist joints, but is mostly now lined by national restaurant chains, big box stores, modern hotels, and other symbols of the commercial circus that has become modern NASCAR. But it has not always been so. Although Henry Flagler and his wealthy norther ilk did make the Daytona Beach area into a playground for rich boys with their novel automotive toys up through the early 1920's, the speed record seekers eventually discovered the Bonneville Salt Flats and rich kids decided to spend winters further down the Florida coast in Palm Beach. When the Great Depression set in, the area was hit hard. In 1936, Daytona Beach officials attempted to inject some badly needed cash into the local economy and raise the flagging spirits of the citizenry by asking a local resident and former IMCA dirt track champion, Sig Haugdahl, to organize a big race. 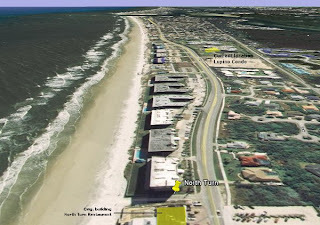 Haugdahl designed a 3.1 mile course that combined a straight stretch of Volusia County beach and a portion of two-lane Highway A1A, also known as Atlantic Avenue, which ran parallel to the beach on the other side of the dunes. Thousands of people from all over the region attended the event, but it was not a commercial success. Haugdahl tried again the following year and though just as popular the sponsors again saw zero return on their investment. Haugdahl had had enough. But then a funny thing happened. The owner of a local auto repair garage, who also happened to have a passion for fast cars, had participated in those first two races. In 1938, he decided to take over the organizational and promotional duties for the race circuit, and boldly scheduled two events that year at the one-of-a-kind road course. Both events were profitable, and resulted in three more races the following year, and three more the year after that. The money started rolling in. That young man's name? William France Sr.
France founded NASCAR in February of 1948 and established offices in Daytona Beach, which marked the beginning of a motor sports dynasty that has no equal. Today, NASCAR is still owned by the France family and is chaired by Brian France, grandson of the founder. NASCAR claims that 17 of the top 20 attended single-day sporting events in the world are NASCAR-sanctioned events due largely to the 75 million fans who purchase over $3 billion in annual licensed product sales every year. Many marketers consider NASCAR fans the most brand-loyal in all of sports and as a result, Fortune 500 companies sponsor NASCAR more than any other form of motor sport. So what does all of this have to do with being blind to history? Well, I'll tell you. Growing up in Central Florida and being a gearhead from a tender young age, I knew that NASCAR had gotten its start by racing on the beach. 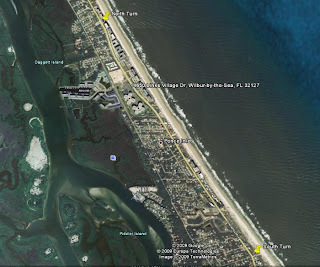 But I had always assumed that the original road course was located on Daytona Beach, perhaps somewhere near the historic beach boardwalk where International Speedway Boulevard meets the Atlantic Ocean. Today, this area of Highway A1A is crowded with a convention center, hotels, high-rise condos, and large and small shopping venues. One restaurant sports the brightly painted body and chassis of a stock car mounted to the wall over the front door. Surely this is where all of that early history was made. About ten miles south of the hustle and bustle of Daytona's historic and commercial heart lies the sleepy village of Ponce Inlet--a straight shot down the stretch of coastal highway known as Atlantic Avenue. But the difference in atmosphere is light-years. No 20+ story high-rises. No sprawling, glass-fronted T-shirt shops. No cheesy, Viking-themed hotels. No mini-golf. No convention centers. The view along Atlantic Avenue in Ponce Inlet is all beach houses interspersed with a few condos...but never over seven floors. There's not even any restaurants along the beach, except one. One-half mile north of our current residence on Atlantic Avenue in Ponce Inlet is a small, rectangular, unassuming, single-story restaurant. 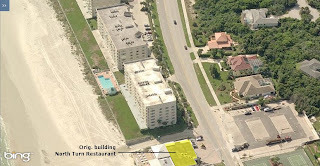 It's nestled in between the road and the dunes that mark the edge of the white, sandy beach. It's quite easy to miss if not for the small sign by the edge of the road that reads, "Racing's North Turn Beach Bar & Grille". I had driven by it countless times but had never decided to patronize it. I also didn't think twice about the place's name since the number of businesses with racing themes in these parts is without number. Then I happened to read a recent newspaper article about the historic races held on the beach, which piqued my curiosity about the location of the original road course. An article I found on the internet describing the course said that a restaurant now stood near the location of the original road course's north turn from the beach onto Atlantic Avenue. I froze. There was a photo accompanying the article showing the sign in front of North Turn restaurant. I couldn't believe it! Not only did that course run right down the stretch of road in front of our condo, but it also ran along the beach where I built countless sandcastles with my kids--oblivious to the history that had taken place on that very spot. We're talking about the likes of Marshall Teague and his Fabulous Hudson Hornet. Fireball Roberts. Lee Petty. Cotton Owens. Banjo Matthews. Speedy Thompson. The Flock brothers. They all worked their mechanical magic right here in my own backyard, became legends, and helped give birth to a dynasty. 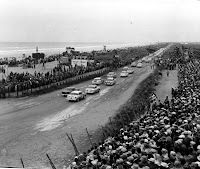 The Daytona Beach Road Course--actually located in Ponce Inlet--hosted its last event in 1958. The following year saw the inaugural Daytona 500 held at the sparkling new Daytona International Speedway. I suppose I shouldn't be so suprised. 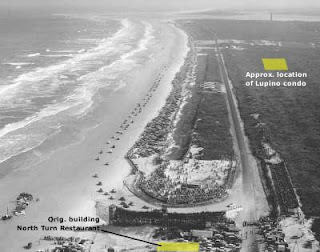 After all, even in the mid-30's, it would have been difficult to conduct a race in the heart of Daytona Beach due to the development of the beachfront. In contrast, there was next to nothing in Ponce Inlet just down the coast. The town then consisted mainly of scrub palmetto and sand...and miles of pristine, seldom-used, hard-packed beach. I'm not sure when the building that now houses Racing's North Turn restaurant was built, but it is clearly visible in many photos of the event back in the day. A large, wooden grandstand was built just south of the restaurant where spectators could get a good view of the action, where today a non-descript block of condos quietly sits as a testament to the implacable forces of time which shield us from our own past. But now that I know what really happened here on my doorstep so many years ago, I'll never look at a visit to the sandy beach across the street quite the same way again.